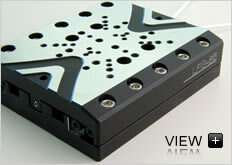 This low profile piezo positioner is available in X and XY configurations. It can handle loads to 2 kg and is based on a proprietary high-force piezo stepping motor providing nanometer resolution and repeatability in closed loop. Vacuum compatible and non magnetic versions are also offered. The large platform and the cross roller bearings provide excellent guiding precision and smooth, highly accurate motion in the nanometer range with travel ranges of 1/2", 1" and 2". The stage achieves high speed to 10 mm/sec. Customized versions with up to 6 axes in parallel kinematics formation are available on request.